The Ford Power Stroke engines are designed with heavy emissions controls in mind. This means that the camshafts aren't designed to take full advantage of the air flow the heads can produce. They are designed to reduce emissions by keeping some exhaust gas in the cylinders. This is one of the reasons it is so hard to spool up a non-vgt turbo on your Power Stroke. Colt Cams has worked with numerous performance shops over the years to perfect a suitable upgrade that not only performs better, but is reliable. These cams will help reduce EGT's (by getting the exhaust out of the cylinder and new air in), improve horsepower, improve the engine's performance throughout the entire rpm range (yes, you guessed it, by getting the exhaust out of the cylinder and new air in!) and can support up to 5,000 rpms. 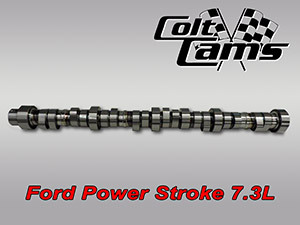 This 7.3L Stage 2 camshaft has a slightly noticeable idle, quick spool up and drop in EGT's. Custom grinds are available for full race, please call us on these.